To find stored fonts in the Windows 10, please start the MS Explorer to install, or uninstall the Windows Fonts! Here are simple examples, how to find fonts folder and make the fonts much more accessible on Windows 10 and Microsoft's famous Windows Server 2016 / 2012! 1.) 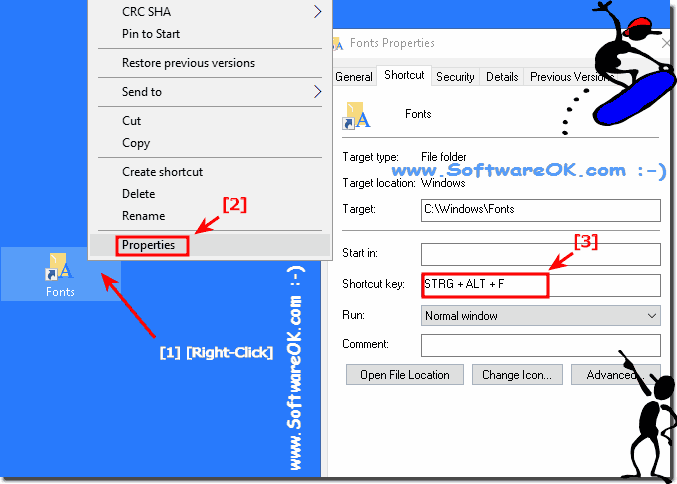 ... Find and open the Fonts Folder in Windows 10! 2.) ... Copy a font eg install from another folder on Windows-10! 3.) ... 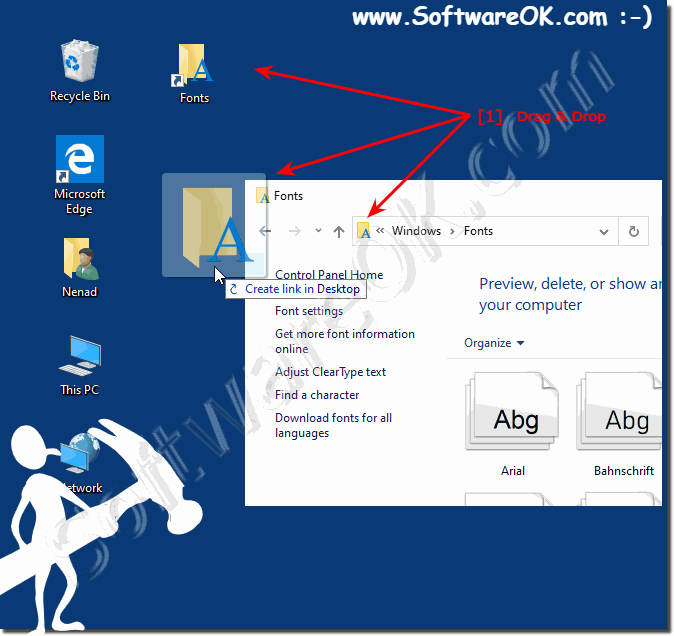 Create a Desktop Shortcut for Windows 10 font Folder! 4.) ... Keyboard Shortcut for a fast access to Font Directory! 1.) Find and open the fonts Folder in Windows 10! Please use the hot key [Windows + E] and enter in the address bar Address: shell:fonts or %WINDIR%/Fonts ! (... see Image-1 Arrow-1) and now you can see all installed fonts on the Windows 10 (... see Image-1 Arrow-1). Please use drag&drop or copy and paste to install the new fonts for Windows 10, or [Del] to uninstall fonts! In Windows-10 Fonts Overview, you can also change the System Font size or Adjust Clear Type text! 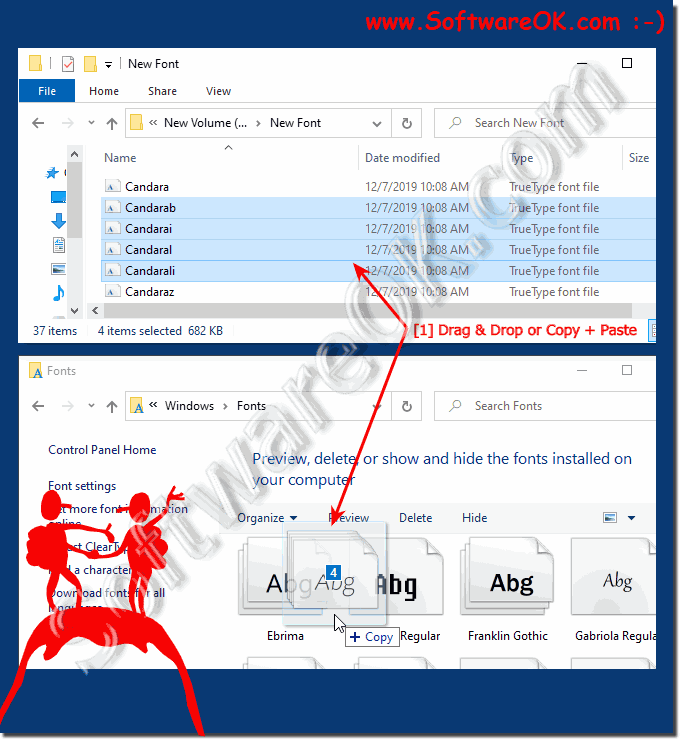 (Image-1) Fonts folder in windows 10 (install, uninstall)! Tip: To delete a font, open the Windows 10 fonts folder. Click the font you want to delete. To select more than one font at a time in Windows 10 explorer, press and hold down the Ctrl button while you click each font. Tip: Right-click the font you want to install and click install. You can also install a font by dragging it into the Fonts Control Panel page in Windows 10 Explorer View. See also: Uninstall fonts from Windows-10 (remove, delete)? 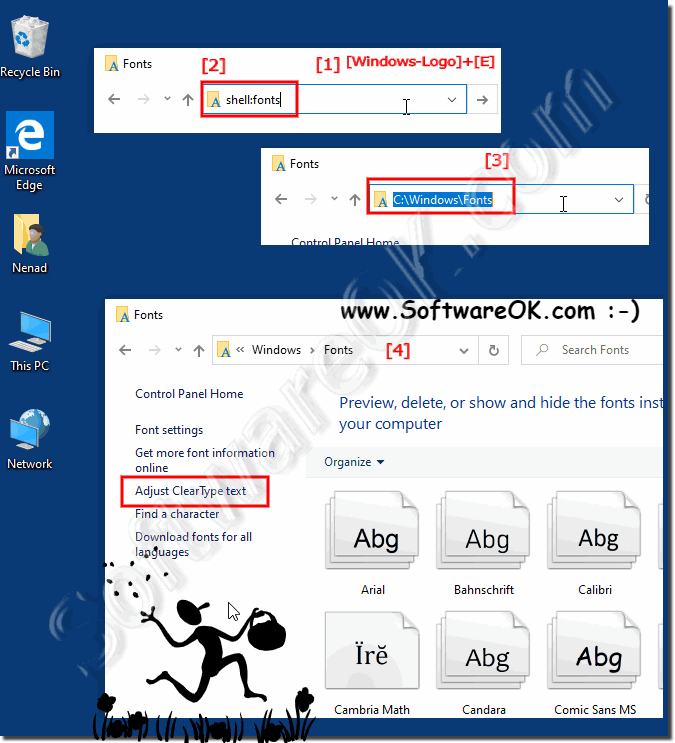 (Image-2) Desktop Shortcut for the System-Fonts on the Windows 10 Desktop! Despite the abundance of preinstalled fonts in Windows 10, some Windows users, especially those involved in design, graphics, advertising, and printing, often require the installation of additional fonts, for example, imported from third-party applications or created for business purposes. What could be easier than installing fonts on Windows 10? But some users of Windows 10 even sometimes need help solving such a task, the information in this FAQ provides the solution to the font theme here! There is also a problem with this font smoothing that should not be forgotten. ► How can I disable ClearType in Windows 8.1 or 10? 2.) Copy a font eg install from another folder! Please open the Windows Fonts Folder and the source folder of new fonts and drag & drop or install it via copy & paste! Fonts are ordinary files with a specific extension. For fonts that support Windows 10, the .ttf extension is the TrueType font, and the .otf extension is OpenType. Sometimes a font can consist of several similar files that define the outline of the same font. Before you install a font on your system, you can see what the font looks like. After opening the file, just double-click on the file with the font to see what the font looks like and check if the font matches the font! ► Uninstall fonts from Windows-10 (remove, delete)! ► auto startup folder in Windows 10 ► notepad in windows 10! 3.) Create a Shortcut for Windows font Folder! To see the Windows 10 desktop, press the key combination Windows logo key + D.
Click on an empty space on the Windows 10 desktop, right Mouse-Button. 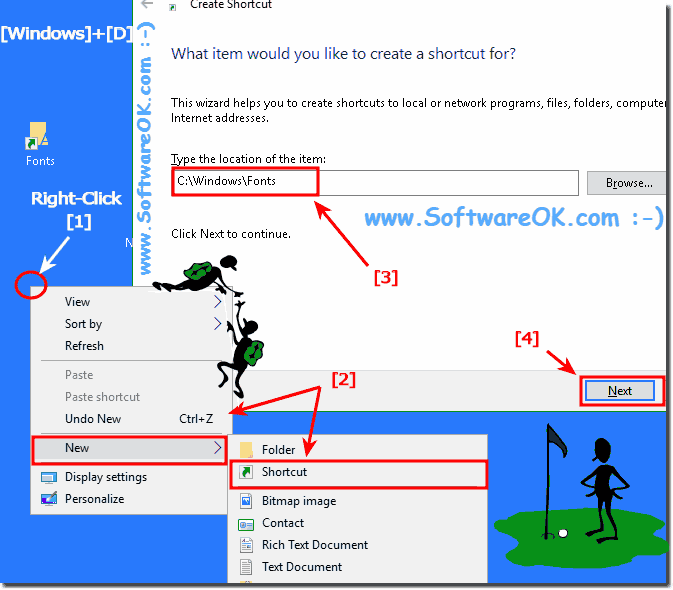 And select "New", "shortcut"
Please enter the name for the Desktop-Shortcut, you can use Fonts or enter Font Folder. (Image-4) Fonts Folder Shortcut for the Desktop! Many users are wondering where the Windows fonts are, here are simple examples of how to find them and make them more accessible, these solutions are not just for 10, but are also an example of working on Microsoft Web Server 2016 and 2012 ! 4.) Keyboard Shortcut for a fast access to Font Directory! If you have created the desktop shortcut for the Font folder, do a Mouse Right Click and select "Properties"
And create / activate a windows Font Folder keyboard shortcut for you Windows! (Image-5) fonts folder keyboard shortcut ergo Hot-Key! The solution is simple and is also suitable for Windows Server 2016 and Web Server 2012 R2 to find the font folder and install fonts! This is the Question of many Window User and hear is the answer for this very important Question, to find fonts on Microsoft's best Windows operating system ever on your personal computer system and business PC!